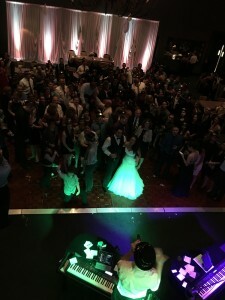 This was not just any wedding, this was a New Years Eve Wedding! And what’s better than ringing in the new year with a wonderful couple, a guest list that wants to party, and a venue fit for a fairy tale: The Stonegate. 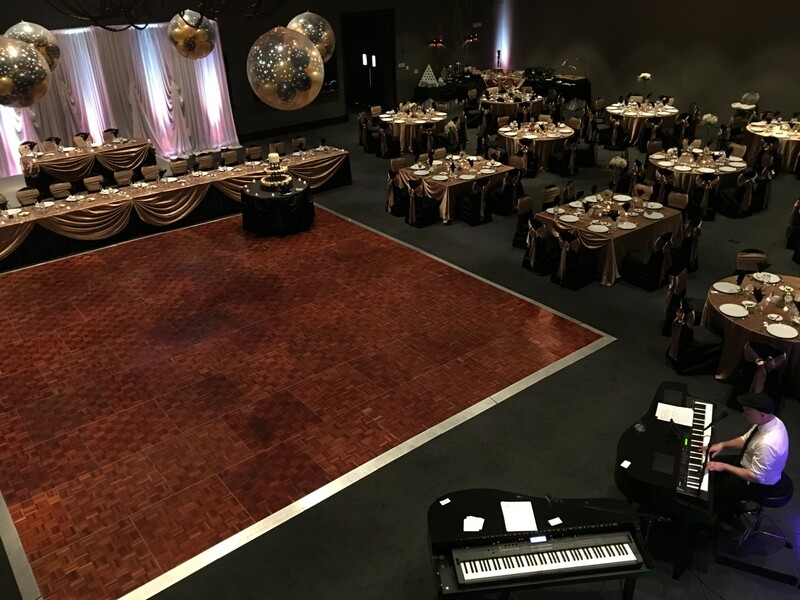 I’m always surprised when I come across Chicago land weddings venues, banquet halls, or conference centers that we haven’t played, or at least quoted. Performing over 100 weddings per year means we see a lot! Yet The Stonegate in Hoffman Estates is one of those venues that remained under my radar, and for way too long. The Stonegate is beautiful. There really needs to be nothing else said (though I will anyway!). The banquet hall that we were in comfortably accommodated the 200+ guests and looked spectacular doing so. 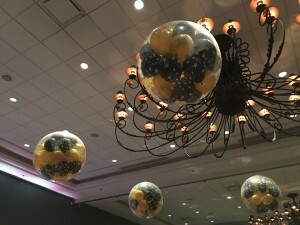 Not to mention the table decorations and black and gold color scheme really made this event feel special. 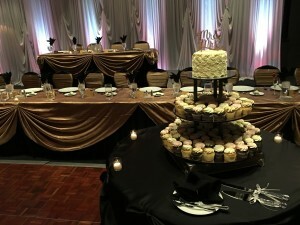 The head table was tiered and set up in a grand fashion. This was a wedding worthy of ending a year on. The cocktail hour was held in the lobby area outside the main banquet hall. As Chris and I completed the final touches of our set up, the guests were able to help themselves to delicious hors d’oeuvres and a martini luge served as a spectacular centerpiece. Seriously, if you want some extra flair to your wedding, get a martini luge. These custom ice sculptures take the bar experience to a different level. 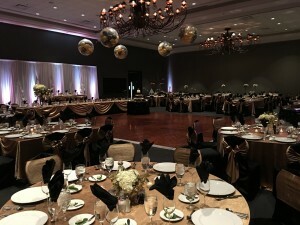 The guests were ushered into the banquet hall following the cocktail hour and Felix and Fingers began the introductions. A couple speeches later and the Stonegate staff began serving. Staff can make or break a venue though, and I’m pleased to say the Stonegate team nailed it. Food was served quickly and seamlessly, and it was amazing for an added bonus. Too many weddings get terribly behind schedule due to a slow kitchen, but the Stonegate delivered in fine fashion. Big balloons filled with regular balloons!! NYE events are some of my favorite. No matter what, you know the guests want to have a good time. The atmosphere is right, people are more relaxed, and weddings fit in beautifully. 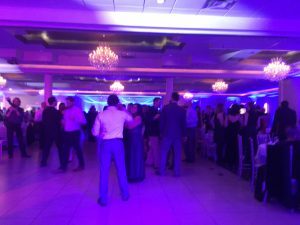 From the first song to the last, the guests really seemed to enjoy themselves. And as the requests started coming in we could really begin to have some fun! There was a special surprise arranged with the videographers who were preparing a day of edit to present. A “Day of Edit” is when the videos taken from earlier in the day actually get edited together into a beautiful montage and shown THE SAME DAY! It’s an amazing touch to have professional videos to share with your guests just hours after the ceremony took place. The count down to the new year was also amazing, complete with large balloons being popped to release regular balloons onto the dance floor. The large balloons were hung from the ceiling, and the sound created by the simultaneous bursting was nearly alarming. The balloon drop was another great touch to a fantastic evening. Thanks and congrats to our bride and groom on a memorable evening. This wedding rocked, The Stonegate was remarkable, and the new year started right. 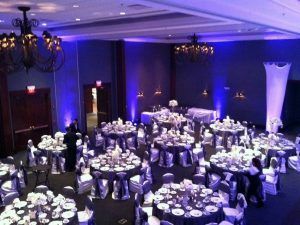 If you’re planning a wedding in the Chicago Suburbs, check out the Stonegate in Hoffman Estates. Maybe take a look into a martini luge. But definitely fill out the form below for a free wedding quote!